These pucks are for the larger air hockey table. 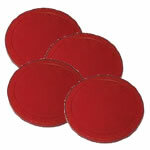 These pucks are 80 mm across and come in packs of 4. The 80 mm pucks are for air hockey tables of 6 foot or more. I would suggest you get some spare ones as they seem to get lost regularly don't they.